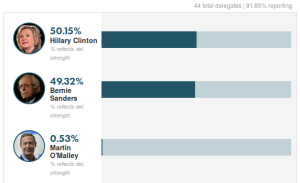 The Democrats are still caucusing in Iowa, and final results are not in. The contest is too close to call, almost evenly divided for most of the evening. Going into the caucus the third Democratic candidate, former Governor Martin O’Malley, suspended his campaign. Martin O’Malley to drop out of Democratic race. That effectively freed up O’Malley supporters to caucus with the last two Democratic candidates standing. I’m willing to wait to morning for final results. That’s it for me tonight. There are reports that in at least one place, Hillary had a tie with Bernie, two delegates each, so they moved some of their people over to O’Malley’s side, to take a delegate away from Bernie. So Hillary got two, Bernie and O’Malley got one delegate each. A little bit sleazy and a more than a bit dishonest of the people who moved to O’Malley. something suspicious happening in 90 percents in iowa. debbie does iowa? lets hope not!